Dutch Sampler [J8992] - $13.00 : Yarn Tree, Your wholesale source for cross stitch supplies. Cross Stitch pattern from Mani di Donna. Do you know someone who is Dutch? This would be a great design to stitch for them! 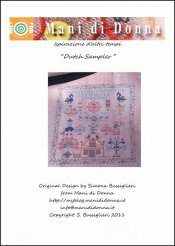 The "Dutch Sampler" features different designs representing the Dutch. Flowers are blooming around the windmill, Dutch style building, etc. The alphabet is stitched at the top of the sampler. Stitched on #2030 Cashel Linen Light Mocha. Stitch count is approximately 150W x 170H.